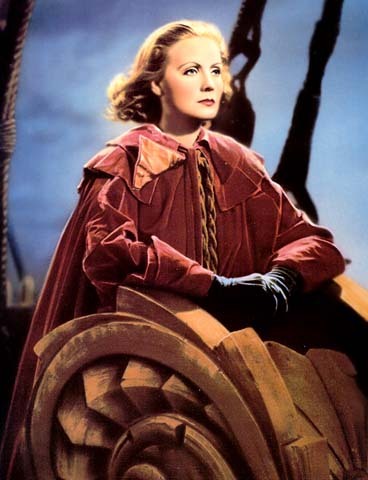 This outstanding but fictionalized movie starring Greta Garbo as Queen Christina focuses upon Christina's conflict between public and personal life, and her love for the Spanish Ambassador, Don Antonio de Pimentel. In the film, escaping from the restrictions of royal life, she rides away from the palace, disguised as a male, and is snowbound at an inn where she incognito shares the last room with Don Antonio. Later, she renounces the throne not because of Catholicism or unwillingness to marry, but because she wishes "to be a human being" and to marry Don Antonio. Christina: Oh, and this great joy I feel now...This is how the Lord must have felt when he first beheld the finished world with all his creatures breathing, living. Don Antonio: And to think a few snowdrifts might have separated us forever... We're inevitable, don't you feel it? Christina: I feel it. But you, how can you be so sure? You know me so little. Don Antonio: That's true. There's a mystery in you. "Spoils, glory, flags and trumpets! What is behind these high-sounding words? Death and destruction, triumphals of crippled men, Sweden victorious in a ravaged Europe, an island in a dead sea. I tell you, I want no more of it. I want for my people security and happiness. I want to cultivate the arts of peace, the arts of life. I want peace and peace I will have!" 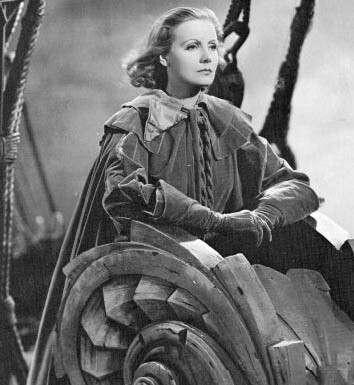 Garbo as Queen Christina , calling for an end to the Thirty Years' War. At the end of the film, after she has abdicated as Queen and she is exiled from Sweden, Don Antonio dies in her arms. Christina stands as a silent figurehead at the bow of the ship, the wind blowing through her hair, as the camera zooms in on the blank, enigmatic expression on her face. What was the thinking at the time? Director Rouben Mamoulian told her to think about "nothing... absolutely nothing.....I want your face to be a blank sheet of paper. I want the writig to be done by everyone in the audience." 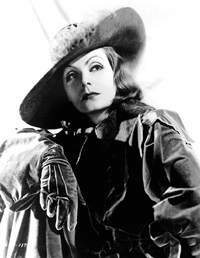 Greta Garbo is more attractive and feminine than the real Christina was. Queen Christina did not abdicate for love. She is not known to have disguised herself as a man and spent several nights with a lover while queen. She most likely died a virgin, and was always determined never to marry. Pimentel did not die in her arms. Christina is not at this point permanently exiled from Sweden. No reference in made whatsoever to Catholicism. "The studio hired a historical adviser, Colonel Einhornung, whose job was to ensure that Swedish royalty would not take offence to the film....The colonel did so, and his voice was cheerfully ignored by Mamoulian and company. The colonel had many complaints about the film's historical inaccuracies, among which were the way the queen is quick to go to bed with a stranger and the fact that the Diet ought not to be seen to clamour for war, as is the case in the early sceneof Christina and her fire-eating courtiers. He asserted that nobles did not wear light-coloured hose and short wigs, nor would it have been possible for there to have been in Sweden's cold climate the abundant fruits that are displayed in the inn scene. More recently, George Fraser Macdonald has faulted the script for showing an old Gustavus Adolphus dying on the battlefield of Lutzen, since the king was only thirty-eight when he died, and he also points out that the queen's abdication was not the consequence of a romantic entanglement. Notwithstanding...Queen Christina does in fact conform to certain aspects of the history of that persiod, through selectively, as represented by the queen's relentless quest for peace, her distaste for dynastic marriage, and her devotion to scholarship." 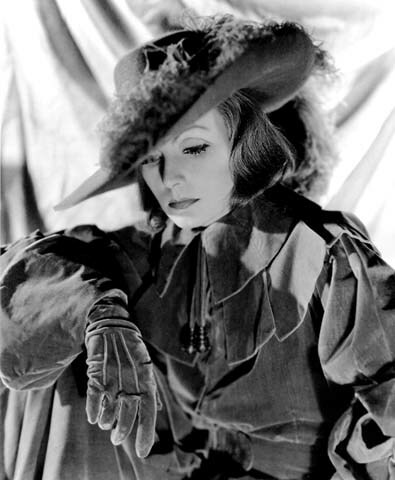 from Queen Christina, BFI Classics by Marcia Landy and Amsy Villarejo. Images were scanned by Torrey Philemon and may not be reproduced. This site was originally created for The Ancient Sites Celebration of Women. Ancient Sites community folded March 30, 2001.
are now being moved to other locations.